Whether it’s due to minor damage or operator oversight, snow thrower maintenance issues can sometimes delay snow cleanup by at least a few minutes. The good news for snow throw owners is that most of these issues can be diagnosed quickly. With a few simple steps, the repair process will restore the equipment’s capabilities and eliminate a few big headaches in the process. Troubleshooting a snow thrower problem can present significant safety risks if equipment owners aren’t careful. Before getting started with troubleshooting, allow the snow thrower’s engine to completely cool if it was recently used. A hot engine can burn the operator and ignite fuel, causing even worse problems than those that already exist. It’s also a good idea to send all pets and bystanders indoors, and to wear protective gloves and goggles that will provide extra safety when working around the snow thrower’s components. With these safety concerns in mind, effective troubleshooting of the most common issues can begin. 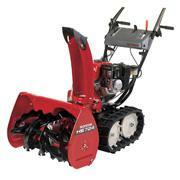 The most common issue to face snow thrower owners is also the one that’s easiest to fix. In most cases, the engine doesn’t start because operators have forgotten to fill the fuel tank to capacity. Check the fuel tank and add gasoline as needed. Another common cause of engine ignition problems is a disconnected or damaged spark plug. Inspect the spark plug to make sure that it’s free of damage and properly gapped, and try starting the snow thrower again. If the spark plug is not the cause of the issue, operators might want to make sure that the choke is set to the “choke” position during ignition. It’s also a good idea to properly prime the engine before pulling the starter grip. Finally, make sure that the fuel valve and ignition key are both turned to “on.” With either of these key parts in the wrong position, the snow thrower simply won’t allow the engine to turn on at all. Erratic engine power is a rare issue, but it’s also one that’s easily solved. In most cases, erratic or inconsistent RPM levels can be attributed to stale or dirty fuel. Stale fuel can be remedied with a fuel stabilizer product, while dirty fuel will need to be drained from the snow thrower and replaced with fresh gasoline. If the fuel doesn’t seem to be the problem, check that the choke lever is not still in the “choke” position after ignition. The gas cap vent hole may be clogged, preventing the snow thrower from accessing its fuel. Another common reason for loss of power is a loose spark plug wire that prevents proper ignition. Finally, it might be a good idea to check the intake chute for clogs that may have caused the engine to shut down as a safety precaution. If the snow thrower suddenly stops propelling itself forward, the issue is most likely due to the drive control cable or the drive belt. In both cases, these parts are likely worn down. The drive cable can be replaced or adjusted by following the steps in the instruction manual, but the drive belt will need to be replaced by an authorized service professional. A problem with snow discharge typically occurs when there is a clog in the intake or discharge chutes. Stop the equipment, turn off the engine, and check both chutes for a buildup of ice and snow. Clear any clog that might be present and restart the snow thrower. If a clog is not the source of the problem, the auger control cable may need to be adjusted or replaced. If the discharge chute doesn’t rotate the full 180 degrees that it should, the issue is almost always due to improper assembly. Stop the snow thrower and turn off the engine. Next, remove the discharge chute by following its assembly instructions in reverse. Check that the chute was properly assembled and then reattach it to the snow thrower appropriately. Attempt to move the chute in all directions and make sure that it doesn’t suffer from a reduced range of motion. Shank’s Lawn Equipment has a wide range of OEM replacement parts that can make snow thrower troubleshooting and repair much easier. Known throughout the Mid-Atlantic as a regional destination for power equipment owners, Shank’s Lawn Equipment is situated just off Interstate 81 in the Pennsylvania town of Chambersburg. The company’s website, at ShanksLawn.com, makes it even easier to find the right parts and have them on hand throughout the winter for effective troubleshooting. This entry was posted in Uncategorized and tagged OEM Parts, Shanks Lawn Equipment, Two Stage Snowthrower. Bookmark the permalink.